Abstract: Movie has unique characteristics. When someone writes an opinions about a movie, not only the story in the movie itself is written, but also the people involved in the movie are also written. Opinion ordinary movie written in social media primarily twitter.To get a tendency of opinion on the movie, whether opinion is likely positive, negative or neutral, it takes a sentiment analysis. This study aims to classify the sentiment is positive, negative and neutral from opinions Indonesian language movie and look for the accuracy, precission, recall and f-meausre of the method used is Dynamic Convolutional Neural Network. The test results on a system that is built to show that Dynamic Convolutional Neural Network algorithm provides accuracy results better than Naive Bayes method, the value of accuracy of 80,99%, the value of precission 81,00%, recall 81,00%, f-measure 79,00% while the value of the resulting accuracy Naive Bayes amounted to 76,21%, precission 78,00%, recall 76,00%, f-measure 75,00%. Abstract: The accident that occurred to somebody will give much suffering; moreover, if the accident gives the serious injury, such as a broken bone which needs to get more seriously treatment. Not only does the patient need the action towards his/her injury, but also he/she needs the psychological therapy in facing the problems happened which is suggested by a psychologist. One of the reasoning method in expert systems is Case-Based Reasoning (CBR). In Case-Based Reasoning, a case-based consists of various cases in conditions or symptoms and solution (the psychological therapy) given. To find out the solution from a new problem given, the system will find any cases in the case-based which have higher the degree of similarity between the cases. This research develops a case-based reasoning system to decide the action of the psychological therapy towards the patients in the post-accident who needs seriously treatment. The psychological therapy involves in giving assistance, consultation, psychiatrist support, and the compound of various actions as well. A case study was conducted from the medical records of psychological treatment at ‘Dr Soeharso’ hospital in Surakarta. Based on the result of the research developed, the action of psychological therapy upon the patient has successfully determined. They have accuracy rates of 60% in the threshold 50% compared to the treatments resulted from the psychologist. The result was found by calculating the degree of similarity between the new issue and all cases existing in the case base. Abstract: Nurse’s scheduling in hospitals becomes a complex problem, and it takes time in its making process. There are a lot of limitation and rules that have to be considered in the making process of nurse’s schedule making, so it can fulfill the need of nurse’s preference that can increase the quality of the service. The existence variety of different factors that are causing the nurse scheduling problem is so vast and different in every case. The study is aimed to develop a system used as an equipment to arrange nurse’s schedule. The working schedule obtained will be checked based on the constraints that have been required. Value check of the constraint falsification used Simulated Annealing (SA) combined with cooling method of Probabilistic Cooling Scheme (PCS). Transitional rules used cost matrix that is employed to produce a new and more efficient state. The obtained results showed that PCS cooling methods combined with the transition rules of the cost matrix generating objective function value of new solutions better and faster in processing time than the cooling method exponential and logarithmic. Work schedule generated by the application also has a better quality than the schedules created manually by the head of the room. Abstract: Stroke is a type of cerebrovascular disease that occurs because blood flow to the brain is disrupted. Examination of stroke accurately using CT scan, but the tool is not always available, so it can be done by the Siriraj Score. Each type of stroke has similar symptoms so doctors should re-examine similar cases prior to diagnosis. The hypothesis of the Case-based reasoning (CBR) method is a similar problems having similar solution.This research implements CBR concept using Siriraj score, dense index and Jaccard Coeficient method to perform similarity calculation between cases.The test is using k-fold cross validation with 4 fold and set values of threshold (0.65), (0.7), (0.75), (0.8), (0.85), (0.9), and (0.95). Using 45 cases of data test and 135 cases of case base. The test showed that threshold of 0.7 is suitable to be applied in sensitivity (89.88%) and accuracy (84.44% for CBR using indexing and 87.78% for CBR without indexing). Threshold of 0.65 resulted high sensitivity and accuracy but showed many cases of irrelevant retrieval results. Threshold (0.75), (0.8), (0.85), (0.9) and (0.95) resulted in sensitivity (65.48%, 59.52%, 5.95%, 3,57% and 0%) and accuracy of CBR using indexing (61.67%, 55.56%, 5.56%, 3.33%, and 0%) and accuracy of CBR without indexing (62.78% 56.67%, 55.56%, 5.56%, 3.33%, and 0%). Abstract: LTE networks were created to improve on previous technologies, where the advantages of LTE networks are at the speed of data transfer and greater service capacity, reduced operational costs and can be integrated with existing technologies.This simulation is used to analyze the video performance of FDD streaming mode in handover process using Network Simulator 3 with 3 cell for different speed and number of users, with delay, packet loss and throughput parameters. The test results show that the performance of streaming video in handover process on all test, not affected by delay value. The highest delay value is still in good category that is 153. 43 ms. The highest packet loss is 54.5% with 60 users at speeds of 100 km / h. The highest throughput value is 0.60 Mbps at a speed of 40 km / h with 5 users and the lowest throughput value is 0.40 Mbps at a speed of 60 km / h with 60 users. The best performance occurred at a speed of 40 km / h, on the contrary at speeds of 70 Km / h and 100 Km / h, the performance decreased due to increased packet loss and decreased throughput value. Abstract: Various clustering methods to obtain optimal information continues to evolve one of its development is Evolutionary Algorithm (EA). Adaptive Unified Differential Evolution (AuDE), is the development of Differential Evolution (DE) which is one of the EA techniques. AuDE has self adaptive scale factor control parameters (F) and crossover-rate (Cr).. It also has a single mutation strategy that represents the most commonly used standard mutation strategies from previous studies.The AuDE clustering method was tested using 4 datasets. Silhouette Index and CS Measure is a fitness function used as a measure of the quality of clustering results. The quality of the AuDE clustering results is then compared against the quality of clustering results using the DE method.The results show that the AuDE mutation strategy can expand the cluster central search produced by ED so that better clustering quality can be obtained. The comparison of the quality of AuDE and DE using Silhoutte Index is 1:0.816, whereas the use of CS Measure shows a comparison of 0.565:1. The execution time required AuDE shows better but Number significant results, aimed at the comparison of Silhoutte Index usage of 0.99:1 , Whereas on the use of CS Measure obtained the comparison of 0.184:1. Abstract: In a software development projects, testing is an activity that can spend time, effort or cost up to 35%. To reduce this, developers can choose automatic testing. Automated testing, especially for functional testing, on web applications can be done by using tools, one of which is Selenium. By default, Selenium testing is done sequentially and without exploiting multithreading, which has an impact a sufficiently long time.In this study, a platform that allows Selenium users to test and utilize multithreading with Ruby language to speed up testing was developed. Thr result shows that Ruby's multithreading has proven to be capable of speeding functional testing up on various web applications. Variations occur depending on the functionality being tested, the testing approach and also the type of browsers used. Abstract: At present, the need to access the data have been transformed into digital data, and its use has been growing very rapidly. This transformation is due to the use of the Internet is growing very rapidly, and also the development of mobile devices are growing massively. People tend to store a lot of files in their storage and transfer files from one media to another media. When approaching the limit of storage media, the fewer files that can be stored. A compression technique is required to reduce the size of a file. The dictionary coding technique is one of the lossless compression techniques, LZW is an algorithm for applying coding dictionary compression techniques. In the LZW algorithm, the process of forming a dictionary uses a future based dictionary and encoding process using the Fixed Length Code. It allows the encoding process to produce a sequence that is still quite long. This study will modify the process of forming a dictionary and use Variable Length Code, to optimize the compression ratio. Based on the test using the data used in this study, the average compression ratio for LZW algorithm is 42,85%, and our proposed algorithm is 38,35%. It proves that the modification of the formation of the dictionary we proposed has not been able to improve the compression ratio of the LZW algorithm. Abstract: Convolutional neural network (CNN) is state-of-the-art method in object recognition task. Specialized for spatial input data type, CNN has special convolutional and pooling layers which enable hierarchical feature learning from the input space. For offline handwritten character recognition problem such as classifying character in MNIST database, CNN shows better classification result than any other methods. 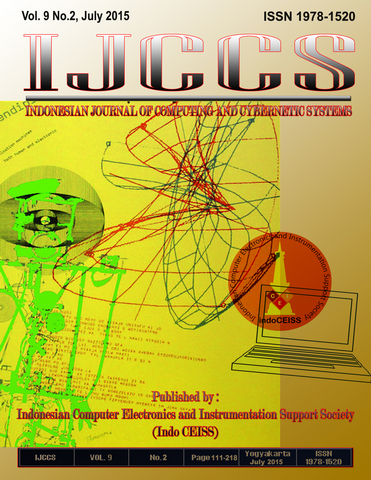 By leveraging the advantages of CNN over character recognition task, in this paper we developed a software which utilizes digital image processing methods and CNN module for offline handwritten Javanese character recognition. The software performs image segmentation process using contour and Canny edge detection with OpenCV library over captured handwritten Javanese character image. CNN will classify the segmented image into 20 classes of Javanese letters. For evaluation purposes, we compared CNN to multilayer perceptron (MLP) on classification accuracy and training time. Experiment results show that CNN model testing accuracy outperforms MLP accuracy although CNN needs more training time than MLP. Abstract: Library services quality is one of the most vital parts in library management. Evaluation of the library services based on the perspective of users is important. In this paper, we propose a collaboration of GDSS-AHP (Group Decision Support System-Analytical Hierarchy Process), LibQual, and IPA (Importance-Performance Analysis) methods to evaluate library services quality. The collaboration of GDSS-AHP and LibQual is used to calculate the weight of each evaluation statement and the level of library services quality based on users’ perception and expectation. IPA is then used to determine the position of the value of each evaluation statement in IPA’s four quadrants to obtain the recommended level for the library services improvement. This study is conducted at the Library of the Ministry of Trade of Indonesia, involving four decision makers: a head librarian, a library academic expert, and two library practitioners. Fifty library visitors become respondents to assess the quality services questionnaires. Based on their responses, we obtain that users’ satisfaction level is at least satisfied by 76.49 %. Meanwhile, usability testing is also conducted on the developed system by using three observation elements: effectiveness, efficiency and satisfaction. The usability testing is performed on five respondents, one admin, and two decision makers, and results in an average usability level of 90.03%.